Marjorie Showalter, age 88, of Hutchinson, Minnesota passed away Thursday, November 16, 2017, at Woodstone Senior Living in Hutchinson. A Memorial Service will be held Tuesday, November 21, 2017, 11:00 A.M. at Hartquist Funeral Home - Lake Benton Chapel in Lake Benton, Minnesota. Interment will be in the Memorial Hill Cemetery in Lake Benton. Gathering of Family and Friends will be held one hour prior to the service at the chapel. Marjorie Ann Showalter was born on June 23, 1929, in Sutherland, Iowa. She was the daughter of Nathan and Myrtle (Maranell) Crooks. Marjorie was baptized as an infant, and was later confirmed in her faith as a youth in Bertha, Minnesota. 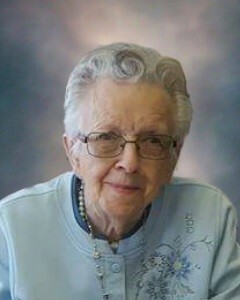 She received her education at Lake Benson High School Class of 1947. On September 21, 1947, Marjorie was united in marriage to Virgil Showalter at St. Paul’s Lutheran Church in Worthington, Minnesota. This marriage was blessed with five children, Rose, Vernon, Raymond, Charles, and Elaine. Marjorie was a loving homemaker to her husband and children. Marjorie and Virgil resided in Lake Benton, Windom, and later moved to Hutchinson in 1992. They shared 49 years of marriage until Virgil passed away on February 28, 1997. Marjorie enjoyed crocheting afghans and doilies, baking, and cooking. She also enjoyed traveling to Germany and England. She especially enjoyed spending time with her family, grandchildren and friends. When Marjorie needed assistance with her daily care, she became a resident at Woodstone Senior Living in Hutchinson in 2014. She passed away there on Thursday, November 16, 2017, at the age of 88 years. Nieces, Nephews, and many other relatives and friends. Marjorie is preceded in death by her Parents, Nathan and Myrtle Crooks; Brothers, Gerald Crooks, Richard Crooks, and Everett Crooks; Brother-In-Law, Norman Wolf; Sisters-In-Law, Gertrude Crooks, Patricia Crooks, and Ruth Crooks; and Great-Grandchild, Macully Showalter. May your hearts soon be filled with wonderful memories of joyful times together as you reflect on a life well lived. We will soon reap the blessings of Jesus’ sacrificial death. (John 3:16) Soon, our loved ones will live again on peaceful new world. Growing old and death will be no more (Acts 24:15; Revelation 21:3, 4; Psalm 37:11) Please feel welcome to visit one of our local Christian congregation of Jehovah’s witnesses in your area, and/ or visit our website for more practical and encouraging Bible answers, (jw.org). So sorry for your loss. Your family is on our thoughts and prayers. May the memories you hold in your heart bring healing and peace to your soul. Our deepest sympathy to your family. Marge was a great lady. She loved to give me a hard time every time I met her and joke with me. I will miss that. But I will also have GREAT memories of her. Sympathy to the family and friends.